I love solitude, love being alone, love the way silence folds around my head and shuts out the world until nothing exists but my thoughts and the wind (if I am outside) or the cats purring (if I’m inside). I write best after being alone for a few hours, and in those hours I seemingly do nothing. I wander around the house, picking things up and putting them back down again. I bake bread or muffins. I take the dog for a walk in the woods. I run up in the mountains. Sometimes I swim, and oh, the feel of the water against my skin as my arms push off, my legs kick. After about twenty laps, my breath evens out and I fall into a cadence that is so soothing and peaceful that it’s akin to a meditative state. Swimming blocks out the outside world, narrows my perception to just my mind and my body, and I suppose that’s what I love about it. 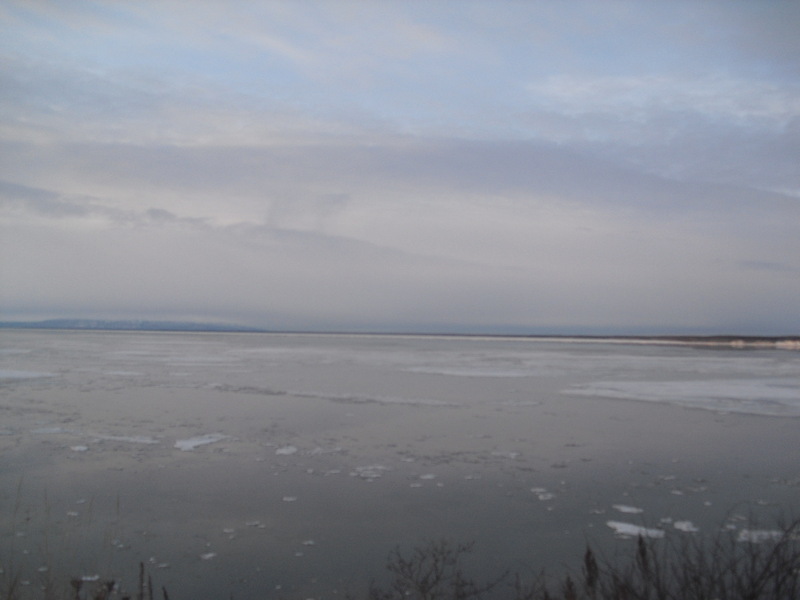 View of the inlet from the Coastal Trail. But earlier today, as I walked the dog along the Coastal Trail, no one else around, the snow lavender in the late afternoon light, I wondered if I really needed to be alone as much as I think. Yes, writing does demand solitude and yes, it’s difficult to write while surrounded by people or noise, yet I did it for years as a journalist. And granted, writing fiction and poetry is different from writing feature stories, it’s not that different. I’m using the same brain, after all, the same thought processes, the same trail of creativity. I wonder how much of my professed “need” for solitude is a crutch, an excuse. I wonder if it’s a way of hiding, not from life exactly but from the parts of myself that I may not like, the louder and more brasher social self. I wrote about this in yesterday’s guest post at Wanted Readers, which you can read here. The piece touches about when I lived in Seward, a small fishing community at the end of the Alaska road system, and what it was like living so close to the wilderness, and how I often went days without talking to anyone but the dog as I sat at my desk in front of windows looking out over Mount Marathon and Mount Benson, and how that sense of wildness merged with my sense of aloneness until it was impossible to separate the two. I still miss those days. I miss running in the mountains and then coming home and sitting down to write, still sweaty and muddy, and how the energy of the mountains and the wind and even the near constant rain merged with my words. Solitude can be pure; it can be almost holy. And I miss that. I don’t want to move back to Seward but yet at the same time I long to move back. Why do we always yearn for the things we can’t have, the things that don’t fit, the things that aren’t necessarily the best for us? Places can be like love. We can desire them the way we do lovers. And solitude too, I think. 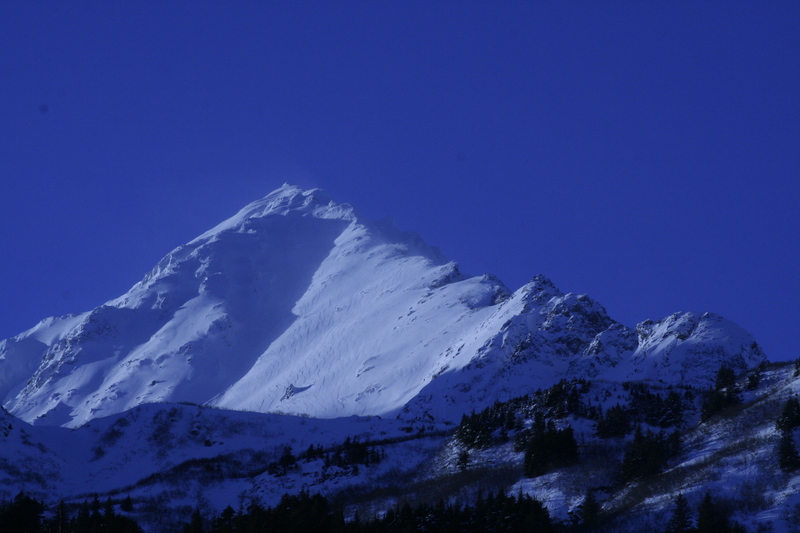 View outside my living room window when I lived in Seward. 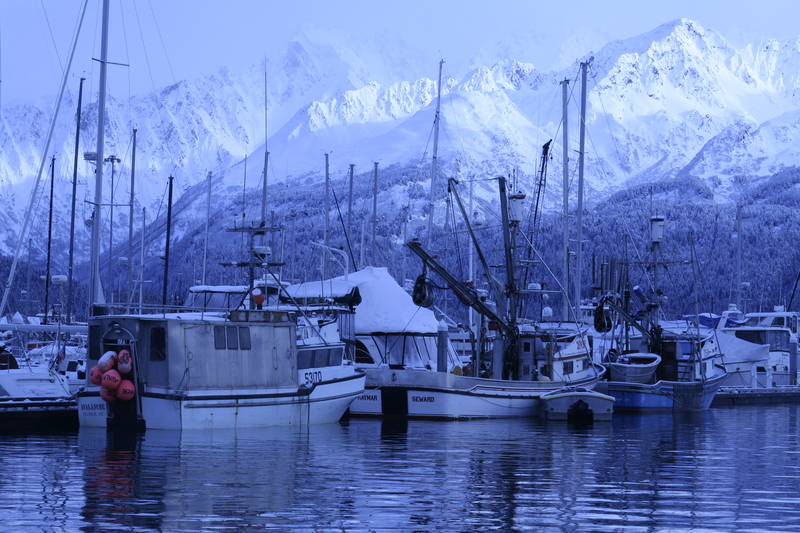 Seward Small Boat Harbor in the winter. 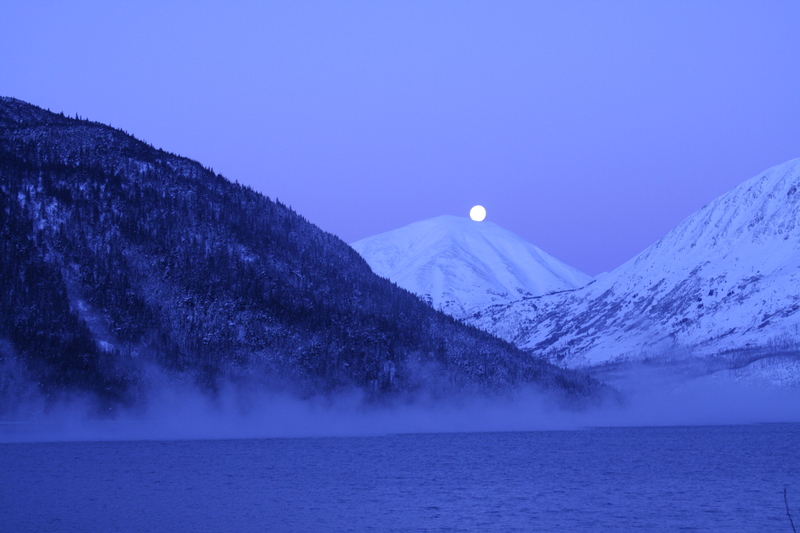 Full moon outside of Seward.